SUS can finally return to its original format. I have a clear memory of writing this post. I especially remember picking the Sam the Eagle gif. It made me laugh, because of his indifference, but I wondered if it would make sense. I also wish I had just restarted. I didn’t explain my absence, so what’s the point of the post? The Epilogue would have been a better start. Did anyone buy that 4-pack? I’m still more fascinated by the black instead of the five figures. Does anyone have a 4-pack with that black background? I’ve never seen one. That’s what makes me think it is a re-card, but that seems stupid and a colossal waste of time. I think the 4-pack sold for like $20. 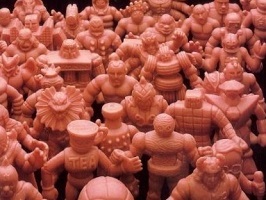 If it is real, then it has to be the oddest M.U.S.C.L.E. item ever. This entry was posted on Saturday, January 26th, 2019 and is filed under UofM News. You can follow any responses to this entry through RSS 2.0. You can skip to the end and leave a response. Pinging is currently not allowed.